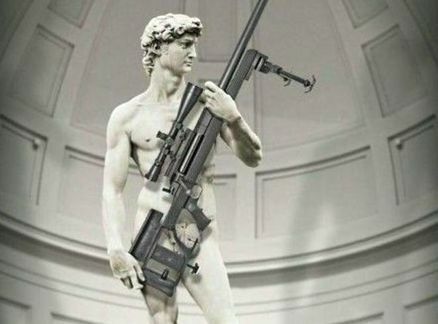 An advertisement by an Illinois-based weapons company showing Michelangelo’s David holding a rifle has sparked outrage in Italy. Italy’s Culture Minister Dario Franceschini said the image was offensive and violated the law. A number of Italian media web sites carried the image of the advertisement showing David holding a bolt-action rifle. ArmaLite advertisement carries the line “a work of art” in promoting the $3,000 rifle. Dario Franceschini urged ArmaLite to withdraw the advertisement for the AR-50A1. Historical Heritage and Fine Arts Board curator Cristina Acidini has issued a legal notice to ArmaLite to withdraw the image, saying it distorts the artwork. The Italian government says it has copyright on the commercial use of images of David. Angelo Tartuferi, director of Florence’s Accademia Gallery, where the statue is on display, told Repubblica newspaper: “The law says that the aesthetic value of the work cannot be distorted. The marble statue of David was created by Michelangelo between 1501 and 1504 and is considered a masterpiece of the Renaissance.